Such dust, Just compare it to Greater Healing Potion. People thought this scheme would summon bombs/boom bots. The real card also has bombs in its art, but it gives armour? Why? Card art has nothing to do with its effect. Bombs = armor? Why would anyone play this over shield block? Pretty terrible card. Also the art is terrible considering it's an armor gain card.. Greater healing potion is playable and has been in decks, because you don't need to hold it for 11 turns for it be useful. 4 turns for it to become Iron Hide for 4 mana. This got to be one of the worst cards ever printed. I dunno, could be a life saver late game. If you get it up to 10+ armour and can still play a decent bodied minion in the same turn. A card that's not dead for 10 turns after you draw it is a better life saver. I actually laughed out loud when I saw this on the stream, my god what a horrible card. If this was 1 mana it would still see no play. One of the worst cards ever printed. This proves to me that some card will be printed that upgrades the schemes, and likely a hand or deck function at that. There is no way this releases without some sort of additional upgrade card(s). As many of you say: it is just straight up unplayable even at 4 mana gain 10 armor. I mean come on, Druid became the armor gain class when it had a flexible 4 mana gain 12 armor WITH the addition of being able to go in different directions instead of armor gain. So....a pretty useful card that will see a lot of play then? I thought that too, because that's the only thing that makes sense. 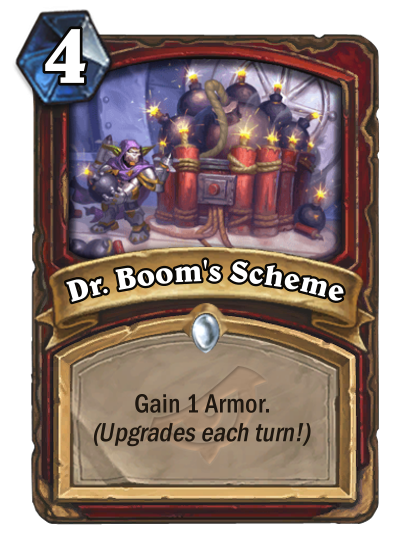 Also the title of the card, Dr. Boom's Scheme sounds like it should be shuffling bombs. What part of gaining armor is schemey at all? Very lazy. They should've held off on revealing this card and made it part of the dump at the end so they could have time to do a proper rework. One of the worst cards I've ever seen. I think this is safe to say that some of the new schemes won't see play. This one is just as bad as the Warlocks by far. No. I said to compare this card to Greater Healing Potion, just to understand how bad this card is. You need 11 turns for it to become similar to potion. Do you people here understand what "compare" means? And Greater Healing Potion did not see a lot of play anyway. Useless. Shield Block is 1 mana less, not dead for along time, and draws you a card.